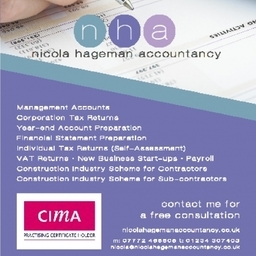 Welcome to Nicola Hageman Accountancy - Working for your business We are Chartered Management Accountants in Bedford and we strive to ease the stress that managing your finances can cause. We are here to help you understand how your business is running and to help you to maximise its potential through monthly or quarterly management accounts. We ensure that your business is set up in the most efficient way to minimising your tax liability. We can take on as much or as little as you need so that you can focus on running your business. We love working with small businesses and start up, subcontractors and the self employed. We want to be your partner and we have the time and commitment to make sure that you feel comfortable with the financial aspects of your business. We can work with local businesses as well as businesses based across the country utilising online accountancy packages, email, skype and phone to keep in touch. My name is Nicola. And I am not your average bean counter. Yes, I am a qualified Chartered Management Accountant and CIMA Member in Practice, But I am a bit different to the more 'traditional' companies offering traditional services. I have been fortunate enough to have worked in many different positions, from traditional management accountant through to new business financial appraisal and commercial management. This has given me a fantastic opportunity to deal with people from all walks of life, and develop an ability to build strong working relationships. My main strength is helping my clients understand their finances - and it's not easy to find an accountant that will take the time to make sure you are truly happy. Please do not hesitate to contact me if you would like to find out how I can help you. Year End Accounts We take the bookkeeping entries and turn them into a set of accounts to show you how your business has performed over the year. Self Assessment Self assessment forms can be tricky and one small mistake may leave you paying more tax than you need to. Construction Industry Scheme (CIS) for Contractors If you are a contractor you need to register with HMRC and follow the rules to paying sub-contractors. Bookkeeping Bookkeeping can distract you from running your business - Nicola Hageman Accountancy can take away this problem. Payroll Managing a payroll service can be time consuming for your business, you have to ensure that you can process it at the same. VAT If your turnover is over the threshold you have to register for VAT. Even if you are under it you are able to register voluntarily. Forecasting & Budgeting For you to know if you are succeeding you need to know where you want to be.